Consider a group of runners competing in a 100m sprint race. 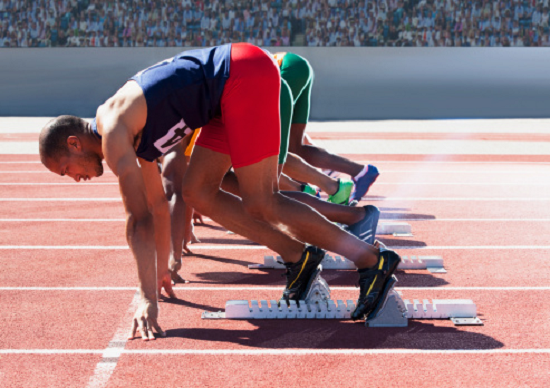 As each positions himself in the blocks, the end that is in each runner’s mind, as a potentiality that is realised as objective, is the crossing of the line 100m away. At the sound of the gun, the subject affection and will to realise the end initiates, contextual factors permitting, the first movement forward, and, subsequently, in an unbroken stream of action, all the movements that transport the body of each runner towards the finishing line. Each action that occurs is contextually enabled, thus determined. Time is being recorded in idea form units of duration in that contextually realised process; the seconds tick away on a recording device. Finally, the end is achieved, for one of the runners victory, but for all the completion of the race, at least in the attempt, in the enabling contextual circumstances. The process stops. And the timing device stops, recording to 2 decimal places the duration of the race, the fixed result, unless disputed, now retained referentially. To an observer of the race, he will, in affection of the enactment of the end, retained in instant idea form as an objective potentiality, see runners executing a motion, which at any point in the race is indicative of the process to the end, as its purpose. It is the affection for the end in potentiality that is objective that explains his participation as an observer, in which affection all elements perceived of the race, the runners, their physical and personal characteristics, and all the associated sights and sounds, the white lines of the track, the flags, are realised as contextually enabled in the enactment. Generally, in the observation of everyday sights, there is in each object a point in a contextual process that is being enacted in an implicit subject affection for an end held in potentiality that is objective, or else that object would not exist or endure. Significantly, each object or action is contextually enabled, just as in the race, towards the enactment of the end. The purpose or teleology of a process is to an end that renders its objective potentiality actual. Note, the actuality of the end, as yet to be achieved, is in the objectivity of its potentiality. Objective potentiality of the end in contextual terms is a metaphysical concept that draws all contextual realisation enabling the process. In everyday events we discern in the concept a purpose in those processes we understand as to the end in objective potentiality. For example, every car seen on the road is heading towards some end, which as an observer I assume, and which in the driver’s mind is objective even though held in potentiality as a concept. The existence of a contextually enabled process in the wider, even universal realisation of events is not merely evidence of an end held in potentiality that is objective, endowing a teleology to all events in respect of that end, but is implicitly in subject affection of enactment of the end through the enabled contextual process. The creative process, at any stage in it, is clearly one of contextual realisation of rightness of form, contextually enabled, which indicates the realising affection of the process as one for rightness realisation, implicitly, therefore, subject. The teleology of the process is towards realisation in enactment terms of a potentially objective end, which would be the form of rightness itself. We observe in the creative process of enabled forms a gradual conceptualising of the form of rightness, from the contextual forms of inanimate and animate nature, to, in man, rightness realised as to idea form, and refined to a concept of righteousness. The teleology of the creative process, or existence as contextually enabled, is, therefore, to an end enactment of righteousness conceptually held in objective potentiality that indicates its actuality. The actuality of righteousness as an end in objective potentiality indicates a pre-existent metaphysic, and since this is the end of all contextually enabled existence, it is none other than the affective realisation of the creative principle that reveals righteousness as of the Divine affection. The Divine affection can only be in affection of manifestation of what is Divine, thus the righteousness held in objective potentiality is none other than the Divine Righteousness.